Right whales on their way and seismic blasting awaits them. Right whales are on the brink. Take Action now to protect them. Fisheries Minister Dominic LeBlanc announced new measures last week that are intended to protect right whales. But a gaping hole in protections was left - in favour of oil and gas companies - for what could have been the most heroic announcement of this minister’s professional career: to order a stand-down of all oil and gas exploration anywhere near right whale critical habitat. No mention of preventing the crippling effects of seismic blasting was mentioned at the live announcement – not a word. An earlier and most troubling announcement was made in February – that BP (British Petroleum) has been given the go-ahead from our government to drill up to seven new wells. In addition, Statoil of Norway wants to shoot seismic blasts this spring on the Scotian Shelf. (See page 11 of Statoil’s project description to understand how close the blasting will be to right whale critical habitat.) 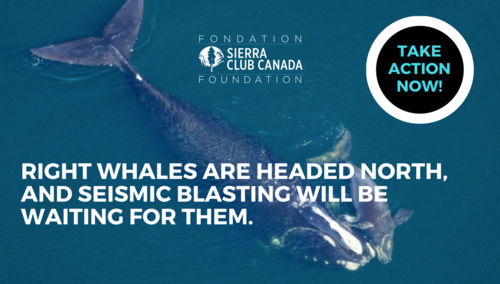 Seismic noise can be heard by up to 2,500 miles from the source - this blasting will be less than 50 miles from critical right whale habitat! And as you know, the federal government continues to ignore our call for a moratorium on oil and gas in the Gulf of St. Lawrence - where most of the right whale deaths occurred last summer. The Fisheries Minister and this government have a once-in-a-lifetime opportunity to be heroes, and they must seize it. Because after this summer, they may be no more lifetimes for right whales – their fate may simply be sealed. The government needs to say “NO” to oil companies and create a safe perimeter around whales by removing the horrific threat of seismic blasts. They must protect these whales. If they do not, we will watch the last of this species die one-by-one until they are all gone, and the legacy of not acting quickly enough will be attached to this government. If we do not stop it, seismic testing from the oil and gas industry will likely be the end for this fragile population of our right whales who are at this moment on the brink. Dr. Lindy Weilgart from Dalhousie University offers an unequivocal caution: "As the government's news release itself admits, underwater noise is a substantial contributing factor to the right whale population decline. As such, seismic surveys for oil and gas need to be prohibited anywhere where harmful noise levels can degrade right whale habitat. While the proposed measures are laudable, an ecosystem approach to safeguard critical right whale habitat is required, rather than a piecemeal approach to various individual threats." Thank you for taking urgent action today and thank you for standing in defence of these extraordinary whales.